A week ago Ole Miss was reeling, coming off a disappointing 1-2 series vs Tennessee. On the horizon, the Rebels had a matchup against their personal nemesis, Southern Miss, as well as a road date looming with defending national champion and current SEC East leader, No. 1 ranked Vanderbilt. Many thought finishing 2-2 for the week would be a good thing. At the end of the week, the Rebels indeed ended up with a 2-2 record–but perhaps not in the manner anyone would have predicted. Tuesday night vs. Southern Miss. 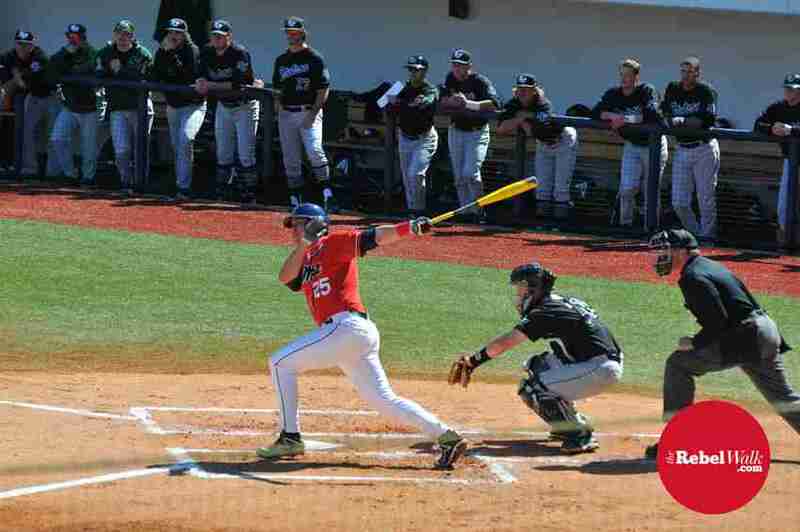 On Tuesday, April 7, Ole Miss faced the Golden Eagles of Southern Miss. The Rebels found their bats and put five runs on the board, tallying 11 hits in the process, but the pitching let them down as the Golden Eagles scored six runs on 13 hits. Beginning the week 0-1 was not the way the Rebels wanted to start, but it is where they stood after Tuesday’s game. Carson Fulmer struck out 14 Rebels in the Game 1 win. Remember this name: Carson Fulmer. He was absolutely dominant against Ole Miss as he pitched a complete game and struck out fourteen Rebels. 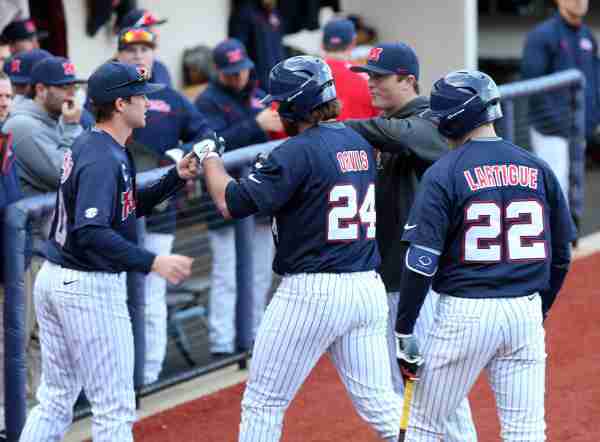 Ole Miss was only able to muster two hits for the evening, those coming from Colby Bortles and Errol Robinson. Everything the Commodores did in game one of the series was right: two-out hits, big pitches and great defense. They definitely looked the part of the No. 1 team in the country. Ole Miss had not been dominated so thoroughly all season. The Rebels lost the game, 6-0, and were sitting at 0-2 for the week. 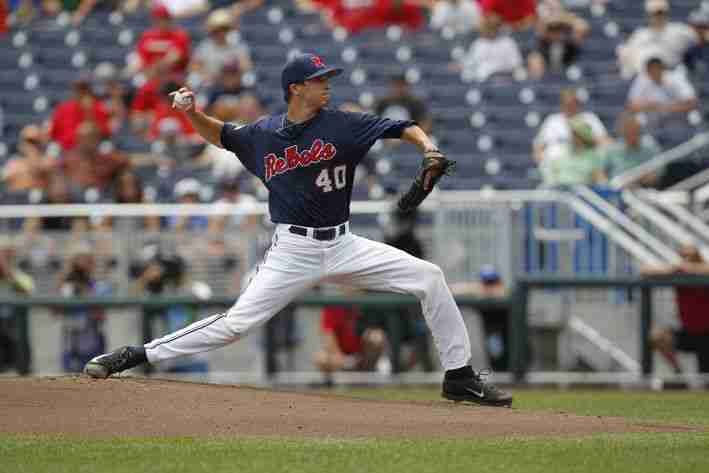 On Friday night, Ole Miss faced the next flame-thrower from Vanderbilt, Walker Buehler. He followed the Fulmer performance with a gem of his own. Buehler scattered five hits over eight innings while striking out 13, and the Rebels found themselves down 5-1 headed to the top of the ninth inning. Clutch hitting: For some reason, the Vanderbilt skipper went to the pen in the ninth. His reliever (Phillip Pfeifer) started shaky as he hit Ole Miss’ pinch hitter, Tate Blackman, and then gave up back-to-back walks of Will Golsan and J. B. Woodman. At that point, the bases were loaded for Colby Bortles who delivered a powerful grand-slam blow to left field for a big time #goodbye that tied the score at 5-5. Little did we know the night was just beginning! Pfeifer settled in after the bomb and pitched flawlessly for six innings. Epic pitching: The Rebels turned to Wyatt Short who struggled but showed grit as he held the Commodores scoreless for two innings. In the 11th inning, Ole Miss was in deep trouble with the bases loaded and no outs. Coach Bianco turned to Scott Weathersby, his grizzled veteran. Scott came in and got two K’s and a harmless flyout to get out of the jam. He went to work and pitched six scoreless innings, working himself out of several jams and setting the stage for Saturday. In the 16th inning, Errol Robinson drew a walk and Henri Lartigue delivered a laser down the right field line for a double to plate Robinson and give the Rebels all the cushion that Weathersby would need. 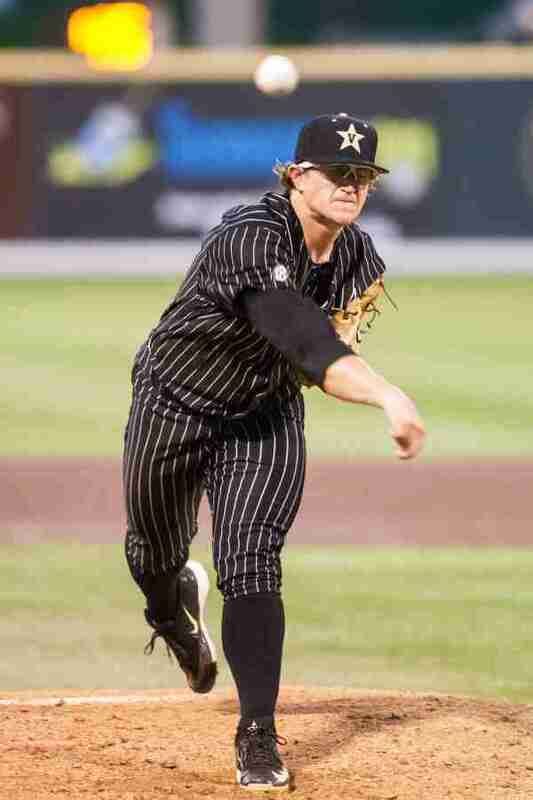 Scott went out in the 16th and worked his sixth scoreless inning en route to finishing off the Commodores. Ole Miss was 1-2 for the week and had one game left against Vandy. The challenge Ole Miss has faced this season has been finishing off a weekend series. This is the one area I think former Rebel assistant coach Cliff Godwin is missed the most, as the team seems to lack the intensity and focus Godwin helped bring on the last day of a series. Ole Miss needed to break that streak Saturday in the final game against the Commodores. The Rebels sent Will Stokes to the mound, and he threw admirably for six innings as he kept the Rebels in the game. The bats were alive, as well. Ole Miss notched ten hits in the game, but none more important than the 7th inning, bases-loaded single by Errol Robinson. Errol came up, took a defensive swing and chopped a ball down the first base line. Then the most bizarre thing happened–the sun got in the way of a grounder and the ball ended up in right field, plating two runs and putting the Rebels ahead to stay! Ole Miss got two solid innings of work on the mound from Sam Smith and then turned to closer Jacob Waguespack who got the save. The Rebels sauntered out of town with a 2-1 series victory over the defending national champions. Ole Miss concluded the week with a record of 2-2. 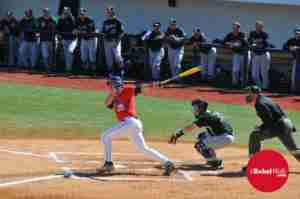 The Rebels won their second consecutive series against teams ranked No. 1 in the country and have brought their season record to 18-18. They have completed a difficult first half of the SEC with a 7-8 record. The record may not sound like much, but after facing No. 1 LSU on the road, No. 1 Florida at home and No. 1 Vanderbilit on the road–not to mention a red-hot Arkansas team on the road–the team may be rounding into shape at just the right time. The Rebels return home to face UT-Martin on Wednesday, April 15th before heading to Auburn for a weekend series. Turn around their midweek record (4-5) and figure out a way to go 4-1 the rest of the way. Remaining midweek games are against: Tennessee-Martin, Central Arkansas, Memphis, Mississippi State and Arkansas State. Record a sweep versus Alabama or Mississippi State. Finish 2-1 on the road against Alabama or Missouri–and 1-2 against the other. Finish 2-1 at home versus Texas A&M. Win 1-2 games in the SEC tournament. If those things happen–and there is no reason they cannot–Ole Miss could finish off the season with a great run! Dan Anderson is a photographer and writer for The Rebel Walk. In addition to his work covering Ole Miss football and baseball for The Rebel Walk, Dan has written for a number of newspapers and has experience as a public address announcer, handling both play-by-play and color commentary. Dan has been involved with athletics as a player, coach or parent for 40 years, and brings this unique perspective to his coverage, whether through his lens or with his pen.